Our teeth are composed of more than one layer. The first is the outer layer, known as the enamel, which protects against the harmful effects of bacteria and plaque. Immediately underneath is a thin layer of sensitive dentin. At the very heart of our teeth is a layer that contains the pulpal material that makes up the tooth's nerve. Most dental problems occur at the level of the enamel. 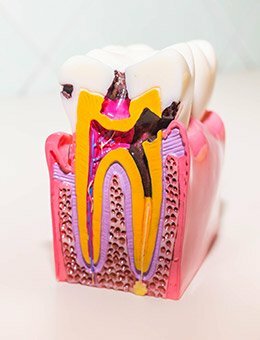 Sometimes, though, the second and third layers can develop problems, often resulting from a deep cavity or a traumatic injury. When this happens, your tooth may develop a bacterial infection or severe discomfort. Why Choose Murphy Family Dentistry for Root Canal Therapy? 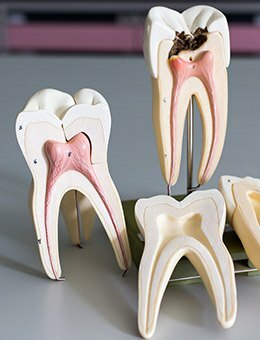 What Happens When a Tooth Develops an Infection? When a tooth develops an infection, the bacteria responsible for it can kill the pulpal material of the nerve. This, in turn, will increase blood flow within the tooth and lead to pressure. Symptoms of an infection also include a persistent toothache and extreme sensitivity to chewing and hot/cold temperatures. At this point, the best hope for saving your tooth is a procedure known as a root canal. During your procedure, your dentist will gain access to the interior of your tooth, where the nerve is located. Then, using specialized instruments, the cause of discomfort will be removed. Traces of infection will be eliminated as well, especially the infected pulpal tissue. Once this has been completed, your tooth will then be filled with a special filling material known as Gutta-percha. After the canals have been filled, the tooth will be restructured with build-up core material for the support of the crown. A custom-made crown will be placed over your tooth to protect and strengthen it. Your crown will also improve your tooth's appearance. This is a common question, and the answer to it is simple. With today's advanced technology and analgesics, root canals can be comfortable. Your procedure can also usually be completed in a single visit. To ensure your health following your procedure, thorough care at home is essential. You will also need to visit our Murphy, TX office for routine cleanings and exams. Call us today to learn more about root canals or to reserve an appointment with Dr. Najari and Dr. Nguyen.